Furious Hibs fans today attacked the decision to send Terry Butcher’s side to Dingwall on a Wednesday night as “absolutely stupid,” claiming it will rob the Easter Road side of their travelling support. The newly-released “post split” fixtures have Hibs down to make the seven-hour round trip to face Ross County on the evening of May 7, their penultimate game of the season. But Mike Riley, chairman of the Hibs Supporters’ Association, fears few Hibbies will make the journey as they’ll struggle to get away from work in time, while those dependent on public transport would have no way of getting back to Edinburgh after the match. Pointing out that Butcher’s team had to play on the Black Isle on Boxing Day, which caused huge travel problems for Hibs fans, Riley said: “Once again there’s no consideration for the fans. “Our supporters struggled to get to Dingwall on Boxing Day and they’ll have great difficulty in getting there again for a 7.45 kick-off on a Wednesday night. It’s the longest journey we have to make and people won’t be able to get off work in time to travel. “It was the same last season when we were asked to travel there on a Wednesday night at the end of January. “Obviously because of the way the fixtures fell before the split we are due another game in Dingwall, but why couldn’t it be played on a Saturday? Once again there’s been no consideration at all for the fans, the lifeblood of the game. “I’m sure if it was being played on a Saturday there would also be a lot of fans who’d take their children – the supporters of the future – but not on a school night when they wouldn’t be getting home until the early hours of the morning. “It’s something that happens time after time, not just to us. Remember, the Inverness fans who had to travel to Easter Road for the semi-final of the League Cup against Hearts which started at lunchtime meaning they had to be up at the crack of dawn to get down the A9 in the middle of winter to support their team. 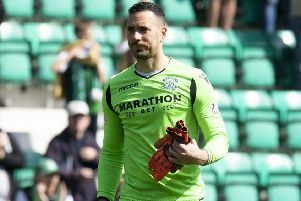 While unhappy at the timing of the Ross County fixture there was one bonus for Hibs fans, though, with the club set to enjoy home advantage in three of their final five games when they had only expected to play two of them at Easter Road. It means they will end the season having had 20 of their 38 Scottish Premiership matches at home. Saturday, April 19: Motherwell v Celtic (12.45, live on Sky Sports); St Johnstone v Dundee Utd. Saturday, April 26: Aberdeen v St Johnstone. Dundee Utd v Motherwell. Sunday, April 27: Celtic v Inverness CT.
Saturday, May 3: Celtic v Aberdeen; Inverness CT v Dundee Utd; Motherwell v St Johnstone. Saturday, April 19: Hearts v Ross County; Kilmarnock v Partick Thistle; St Mirren v Hibs. Saturday, April 26: Ross County v Kilmarnock. Sunday, April 27: Hibs v Hearts (12.45, live on BT Sport). Saturday, May 3: Hibs v Partick Thistle; St Mirren v Ross County. Sunday, May 4: Hearts v Kilmarnock. Saturday, May 10: Hibs v Kilmarnock; Partick Thistle v Ross County; St Mirren v Hearts (all 12.15).